The murder of her best friend at a young age inspired a young Latina from Wylie, Texas to become a politician. Brooke López was 15 when she wrote the wording for Nahum’s Law after the two murderers of her friend Nahum Martinez were tried as minors. López’s work for this law was incorporated into Texas Family Code, Section 58.003 in 2015. This moment, López says, is what jumpstarted her political career. 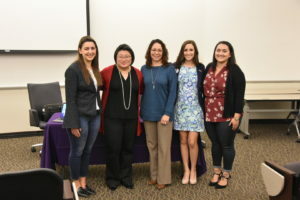 López visited TCU Wednesday as part of the Unique and Strong panel organized by TCU’s chapter of Women in Politics – Ignite. Upon turning 18, López became the youngest person ever to run for city council for the city of Wylie. López said she got the idea on a fishing trip. Wylie, Texas, located about 30 miles northeast of Dallas and has a population of 45,000 people where 61 percent are white, 14 percent are black and 18 percent are Hispanic, according to 2016 Census estimates. “Overall, Wylie is a very conservative political community,” López said. She added that 100 percent of all Collin County officials in 27 cities, county-wide positions, and state representatives are Republican. During her campaign, López faced several obstacles, especially from community members who criticized her age, gender and ethnicity. While she did not win her bid for city council, López, now 21, was appointed by the city to serve as Vice Chairman of the Wylie Public Arts Advisory Board. She has sat on the board for the last two years. Last year, while finishing her bachelor of science in public affairs from the University of Texas at Dallas, López also founded the Lone Star Parity Project, an online publication that profiles women in Texas politics. “We are interviewing every woman who is involved in politics, whether they’re a campus activist, a student government representative, or elected officials,” López explained. During Wednesday’s event, López was joined by Jennifer Treviño, vice president of the Hispanic Women’s Network, and Judge Tina Yoo Clinton, the newly-elected judge for Dallas County Criminal District Court 1. Judge Yoo Clinton talked about how her age and gender affected the way voters saw her, most of them thinking she was too young for the job. “I could tell the voters the progression of my career and it stopped them from referring to my age because my qualifications are more than sufficient,” said Judge Yoo Clinton. In terms of diversity, López discussed the unique position people are in. “I get to proudly wear my experiences on my sleeve because they are exclusive to me and the communities that I represent,” she said. “There’s a difference between being a token representative, yet I’m not actively representing the wants, issues, and needs of those communities, so I started to realize that I should be proud, and so should you, about your experiences. Treviño also offered advice for college students looking to become more civically engaged.